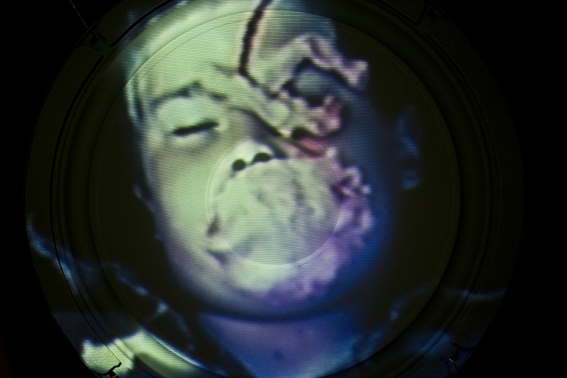 These images are from the series The Ordnance as part of the ‘Hybrids’ Exhibition, 2010, MIC, Auckland. This installations consisted of : a documentary video recording the making of wounds from play-dough on the bodies of each member of F4. The video was projected onto the speaker from which the video’s sound emanated, in an act of turning inward. The light box image is a backlit photograph of a piece of plastic packaging removed from around from a child’s toy gun. The blue, slowly tracking 3D image projection of a gun was made in Maya. Additionally there was an array of guns fashioned from fireworks and toy gun parts, for playing war games. At the time this work was being created an officer in the New Zealand Army was blown up whilst checking ordnance. This work is a testament to humanities perennial fascination with weaponry and it’s manifestation in the manifold worlds of the child.